Warm and luxurious, the high-end Viceroy L’Ermitage creates the perfect spa retreat with its tasteful interiors, gold accents and acclaimed French bistro, Avec Nous. There’s special attention given to pets and children, too, so no part of the family goes untended. You know some kind of high-class, indulgent ceremoniousness is afoot with any hotel that positions itself as a “private club.” It’s not, of course. But the Viceroy L’Ermitage, which is looking even more radiant after a complete redesign in 2017, has done everything in its power to set the bar high. 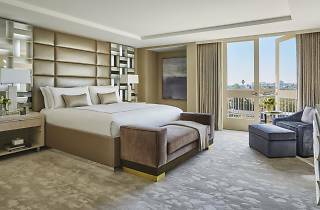 Let’s start with the suites, which are opulent even for Beverly Hills standards, and decorated in champagne tones with gold-plated desk lamps, plush Italian designer sofas, and humongous walk-in closets. In short, our vision of what life must be like as a sultan. All of the suites come with a private balcony, though if you plan on sticking around, there are extended-stay suites with kitchenettes and even-bigger balconies. At Viceroy L’Ermitage, “pet-friendly” translates to welcome cookies and specially prepared pet bowls for four-legged residents—though animals aren’t the only ones dining well around here. The restaurant, Avec Nous, is modeled after a contemporary French bistro, with the lobster omelettes, filet mignon, and cloud-like mille-feuille to match. A full-service spa and a complimentary house car round out the amenities. The only complaint you’ll have is how soon the fantasy must come to an end. 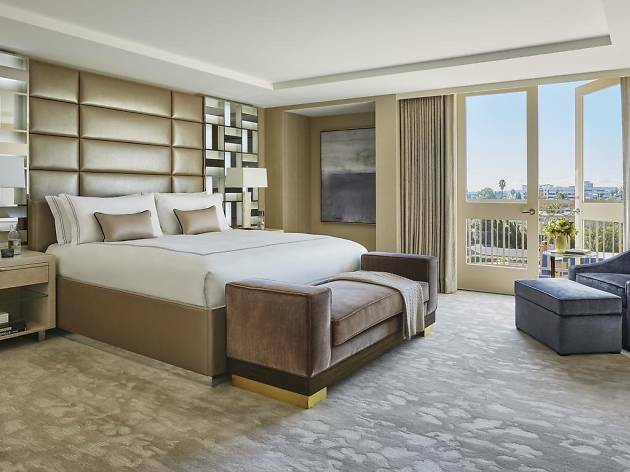 Location: Slightly removed from the main strip, the Viceroy L’Ermitage Beverly Hills sits on Burton Way, though it’s a walkable distance from Rodeo Drive. By car, other nearby ‘hoods like West Hollywood and Fairfax are within easy reach. Beverly Gardens Park: Walk 11 minutes from the hotel to reach this 1.9-mile haven of glimmering green lawns and an illuminated Electric Fountain. Go ahead and take a selfie at the famous Beverly Hills Sign, you know you want to. Xi’An: A favorite for Beverly Hills locals since 1996, the signature dishes at this traditional Chinese eatery, a 10-minute walk from the hotel, are the classic Peking duck, chicken potstickers and crackerjack crispy shrimp—though veggie and low-sodium options are available too. The Polo Lounge: Tucked inside the iconic Beverly Hills Hotel is one of LA’s most visually arresting power lunch spots (though the menu covers all the bases, so no need to limit yourself to a midday meal). Located 1.5 miles from the Viceroy L’Ermitage, a winding brick patio draped by lush green foliage sets the scene for perfectly plated oysters and ahi tuna tartare. Good for: Design lovers, discerning luxury hotel veterans, or anyone celebrating a special occasion will revel in the Viceroy L’Ermitage’s knack for immaculately decorated, lavish spaces that call to mind a Milanese townhouse or a villa in the south of France. Kids, too, have plenty to keep them busy: the hotel’s family program includes a welcome gift at check-in, extensive excursion planning, and board games. Time Out tip: The recipient of dual Forbes 5 Star and AAA Five Diamond status, this hotel is nothing if not exclusive. When you’re settling in for a sun-baked afternoon up on the roof by the pool, you won’t even have to endure the burden of looking other guests in the eye: the hotel places privacy screens in between each sunlounger.